I just returned from a marine fungi workshop set up by Amy Gladfelter and supported by the Gordon and Betty Moore Foundation. The workshop was from May 7-9th at the Marine Biological Laboratory in Woods Hole, MA. 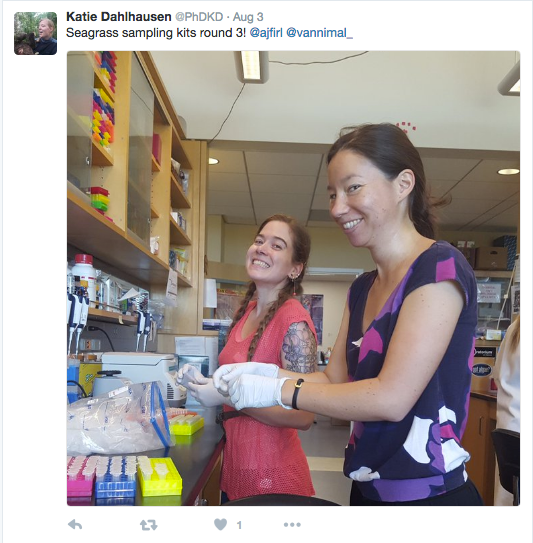 This was actually my second trip to Woods Hole, my first was in summer of 2015 to attend the Microbial Diversity course (click here to read a cheesey poem I wrote about the course). The workshop started with everyone giving 5 minute lightning talks about their research. It was my first time presenting my research ideas to people outside of UC Davis and even though it was only a 5 minute presentation, I was scared to death. I am pretty sure I was literally shaking in the moments leading up to my talk and my imposter syndrome was yelling at me to run far far away so that the real mycologists (doubly scary since they were mostly all professors) wouldn’t know they’d invited a eco-evolutionary microbiologist / bioinformagician into their midst. I can’t really remember anything that happened in those 5 minutes, but I walked away feeling like I had crushed it (take that imposter syndrome). After the talks, we discussed what we thought were some big issues in marine mycology as a group before breaking up into 4 smaller groups with the goal of drafting white papers on these issues. 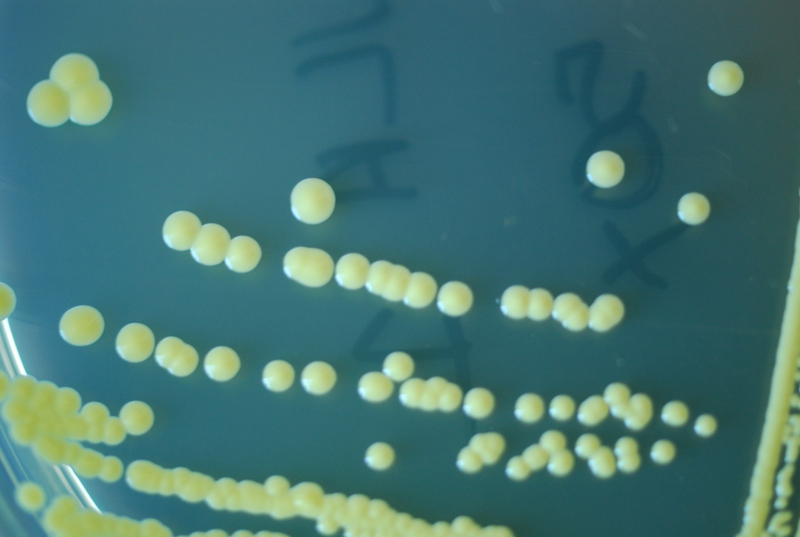 Some of the dominant themes that resulted from these conversations were (1) a desire to inform both scientists and non-scientists of the presence of fungi in the ocean; (2) to impart and quantify the importance of the roles of marine fungi in the ocean; (3) the unclear definition of marine fungi and whether or not this definition includes facultative marine fungi, transient terrestrial fungi or freshwater / brackish fungi; (4) our current lack of understanding of the genetic, phylogenetic, functional and ecological diversity of marine fungi and the spatial scales at which they exist in the marine environment; (5) the lack of standardized protocols for the study of fungi more generally and a need for improved / expanded databases for fungal sequence data that potentially incorporate phylogeny. I got to meet a bunch of awesome people from a variety of fields (including systematics, cell biology, genetics, chemistry, bioinformatics, etc), some of whom I had heard a lot about / seen before on twitter and others who were completely new to me! I only wish it had been 1-2 days longer to further promote networking opportunities and collaborative discussions. Despite the jam-packed workshop schedule, we somehow managed to fit in a boat trip on one of the MBL’s collection vessels, the Gemma. Throughout the conference, I realized a few things (1) I should probably be going to and giving talks at more conferences; (2) networking skills are extremely important; (3) I need to learn more about fungal taxonomy and systematics; (4) I am now super excited to look at and incorporate fungi in some of my other non-seagrass projects; (5) working on my computer on a bus is not a good idea and makes me extremely motion sick. This workshop served as a breathe of fresh air for me and helped renew my excitement for analyzing my seagrass-associated fungal ITS data. It also gave me a few cool ideas of things to do moving forward. I am extremely grateful that I had the opportunity to attend and that the Moore foundation was able to bring us all together. I can’t wait for the next marine fungi meet-up! Gave a talk recently trying to give an overview of this project. I posted slides to Slideshare. Thanks to everyone in the Eisen, Stachowicz and Green labs who have worked on this project and also who helped provide me some slides. Also thanks to the Gordon and Betty Moore Foundation for funding. Eelgrass (Zostera marina) is a marine angiosperm and foundation species that plays an important ecological role in primary production, food web support, and elemental cycling in coastal ecosystems. As with other plants, the microbial communities living in, on, and near eelgrass are thought to be intimately connected to the ecology and biology of eelgrass. Here we characterized the microbial communities in eelgrass sediments throughout an experiment to quantify the rate of ammonification, the first step in early remineralization of organic matter, also known as diagenesis, from plots at a field site in Bodega Bay, CA. Sediment was collected from 72 plots from a 15 month long field experiment in which eelgrass genotypic richness and relatedness were manipulated. In the laboratory, we placed sediment samples (n = 4 per plot) under a N2 atmosphere, incubated them at in situ temperatures (15 °C) and sampled them initially and after 4, 7, 13, and 19 days to determine the ammonification rate. Comparative microbiome analysis using high throughput sequencing of 16S rRNA genes was performed on sediment samples taken initially and at seven, 13 and 19 days to characterize changes in the relative abundances of microbial taxa throughout ammonification. Within-sample diversity of the sediment microbial communities across all plots decreased after the initial timepoint using both richness based (observed number of OTUs, Chao1) and richness and evenness based diversity metrics (Shannon, Inverse Simpson). Additionally, microbial community composition changed across the different timepoints. Many of the observed changes in relative abundance of taxonomic groups between timepoints appeared driven by sulfur cycling with observed decreases in predicted sulfur reducers (Desulfobacterales) and corresponding increases in predicted sulfide oxidizers (Thiotrichales). None of these changes in composition or richness were associated with variation in ammonification rates. Our results showed that the microbiome of sediment from different plots followed similar successional patterns, which we infer to be due to changes related to sulfur metabolism. These large changes likely overwhelmed any potential changes in sediment microbiome related to ammonification rate. We found no relationship between eelgrass presence or genetic composition and the microbiome. This was likely due to our sampling of bulk sediments to measure ammonification rates rather than sampling microbes in sediment directly in contact with the plants and suggests that eelgrass influence on the sediment microbiome may be limited in spatial extent. More in-depth functional studies associated with eelgrass microbiome will be required in order to fully understand the implications of these microbial communities in broader host-plant and ecosystem functions (e.g., elemental cycling and eelgrass-microbe interactions). Background. Eelgrass (Zostera marina) is a marine angiosperm and foundation species that plays an important ecological role in primary production, food web support, and elemental cycling in coastal ecosystems. As with other plants, the microbial communities living in, on, and near eelgrass are thought to be intimately connected to the ecology and biology of eelgrass. Here we characterized the microbial communities in eelgrass sediments throughout an experiment to quantify the rate of ammonification, the first step in early remineralization of organic matter, or diagenesis, from plots at a field site in Bodega Bay, CA. Methods. Sediment was collected from 72 plots from a 15 month long field experiment in which eelgrass genotypic richness and relatedness were manipulated. In the laboratory, we placed sediment samples (n= 4 per plot) under a N2 atmosphere, incubated them at in situ temperatures (15 oC) and sampled them initially and after 4, 7, 13, and 19 days to determine the ammonification rate. Comparative microbiome analysis using high throughput sequencing of 16S rRNA genes was performed on sediment samples taken initially and at 7, 13 and 19 days to characterize the relative abundances of microbial taxa and how they changed throughout early diagenesis. Results. Within-sample diversity of the sediment microbial communities across all plots decreased after the initial timepoint using both richness based (observed number of OTUs, Chao1) and richness and evenness based diversity metrics (Shannon, Inverse Simpson). Additionally, microbial community composition changed across the different timepoints. Many of the observed changes in relative abundance of taxonomic groups between timepoints appeared driven by sulfur cycling with observed decreases in sulfur reducers (Desulfobacterales) and corresponding increases in sulfide oxidizers (Alteromonadales and Thiotrichales). None of these changes in composition or richness were associated with ammonification rates. Discussion. Overall, our results showed that the microbiome of sediment from different plots followed similar successional patterns, which we surmise to be due to changes related to sulfur metabolism. These large changes likely overwhelmed any potential changes in sediment microbiome related to ammonification rate. We found no relationship between eelgrass presence or genetic composition and the microbiome. This was likely due to our sampling of bulk sediments to measure ammonification rates rather than sampling microbes in sediment directly in contact with the plants and suggests that eelgrass influence on the sediment microbiome may be limited in spatial extent. More in-depth functional studies associated with eelgrass microbiome will be required in order to fully understand the implications of these microbial communities in broader host-plant and ecosystem functions (e.g. elemental cycling and eelgrass-microbe interactions). tl;dr – The microbes (bacteria) on plant parts (root, leaf) and near-by sediment were different from each other. We did not find a difference between the microbes on eelgrass leaves or roots at the edge of a patch versus the middle of the patch. However, the microbes in sediments from different locations in the patch (middle, edge, outside of the patch) differed and these differences correlated with eelgrass density. Zostera marina (also known as eelgrass) is a foundation species in coastal and marine ecosystems worldwide and is a model for studies of seagrasses (a paraphyletic group in the order Alismatales) that include all the known fully submerged marine angiosperms. In recent years, there has been a growing appreciation of the potential importance of the microbial communities (i.e., microbiomes) associated with various plant species. Here we report a study of variation in Z. marina microbiomes from a field site in Bodega Bay, CA. We characterized and then compared the microbial communities of root, leaf and sediment samples (using 16S ribosomal RNA gene PCR and sequencing) and associated environmental parameters from the inside, edge and outside of a single subtidal Z. marina patch. Multiple comparative approaches were used to examine associations between microbiome features (e.g., diversity, taxonomic composition) and environmental parameters and to compare sample types and sites. Microbial communities differed significantly between sample types (root, leaf and sediment) and in sediments from different sites (inside, edge, outside). Carbon:Nitrogen ratio and eelgrass density were both significantly correlated to sediment community composition. Enrichment of certain taxonomic groups in each sample type was detected and analyzed in regard to possible functional implications (especially regarding sulfur metabolism). Our results are mostly consistent with prior work on seagrass associated microbiomes with a few differences and additional findings. From a functional point of view, the most significant finding is that many of the taxa that differ significantly between sample types and sites are closely related to ones commonly associated with various aspects of sulfur and nitrogen metabolism. Though not a traditional model organism, we believe that Z. marina can become a model for studies of marine plant-microbiome interactions. Ashkaan’s paper was accepted in AEM! Plant-associated microorganisms are essential for their hosts’ survival and performance. Yet, most plant microbiome studies to date have focused on terrestrial species sampled across relatively small spatial scales. Here we report results of a global-scale analysis of microbial communities associated with leaf and root surfaces of the marine eelgrass Zostera marina throughout its range in the Northern Hemisphere. By contrasting host microbiomes with those of surrounding seawater and sediment, we uncovered the structure, composition and variability of microbial communities associated with eelgrass. We also investigated hypotheses about the assembly of the eelgrass microbiome using a metabolic modeling approach. Our results reveal leaf communities displaying high variability and spatial turnover, that mirror their adjacent coastal seawater microbiomes. In contrast, roots showed relatively low compositional turnover and were distinct from surrounding sediment communities — a result driven by the enrichment of predicted sulfur-oxidizing bacterial taxa on root surfaces. Predictions from metabolic modeling of enriched taxa were consistent with a habitat filtering community assembly mechanism whereby similarity in resource use drives taxonomic co-occurrence patterns on belowground, but not aboveground, host tissues. Our work provides evidence for a core eelgrass root microbiome with putative functional roles and highlights potentially disparate processes influencing microbial community assembly on different plant compartments. IMPORTANCE Plants depend critically on their associated microbiome, yet the structure of microbial communities found on marine plants remains poorly understood in comparison to terrestrial species. Seagrasses are the only flowering plants that live entirely in marine environments. The return of terrestrial seagrass ancestors to oceans is among the most extreme habitat shifts documented in plants, making them an ideal test bed for the study of microbial symbioses with plants that experience relatively harsh abiotic conditions. In this study, we report results of a global sampling effort to extensively characterize the structure of microbial communities associated with the widespread seagrass species, Zostera marina or eelgrass, across its geographic range. Our results reveal major differences in the structure and composition of above- versus belowground microbial communities on eelgrass surfaces, as well as their relationships with the environment and host. Plant-associated microorganisms are essential for their hosts’ survival and performance. Yet, most plant microbiome studies to date have focused on terrestrial species sampled across relatively small spatial scales. Here we report results of a global-scale analysis of microbial communities associated with leaf and root surfaces of the marine eelgrass Zostera marina throughout its range in the Northern Hemisphere. By contrasting host microbiomes with those of their surrounding seawater and sediment communities, we uncovered the structure, composition and variability of microbial communities associated with Z. marina. We also investigated hypotheses about the mechanisms driving assembly of the eelgrass microbiome using a whole-genomic metabolic modeling approach. Our results reveal aboveground leaf communities displaying high variability and spatial turnover, that strongly mirror their adjacent coastal seawater microbiomes. In contrast, roots showed relatively low spatial turnover and were compositionally distinct from surrounding sediment communities – a result driven by the enrichment of predicted sulfur-oxidizing bacterial taxa on root surfaces. Metabolic modeling of enriched taxa was consistent with an assembly process whereby similarity in resource use drives taxonomic co-occurrence patterns on belowground, but not aboveground, host tissues. Our work provides evidence for a core Z. marina root microbiome with putative functional roles and highlights potentially disparate processes influencing microbiome assembly on different plant compartments. Recently the Seagrass Microbiome group has been wrapped up in sending (and receiving!) 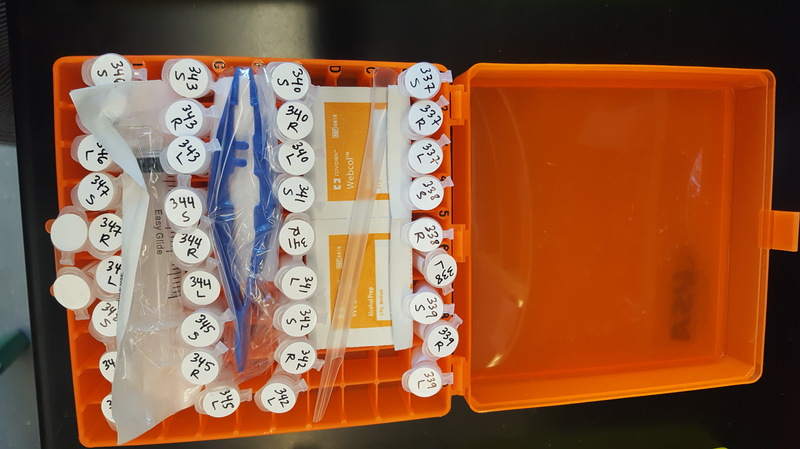 microbiome sampling kits. 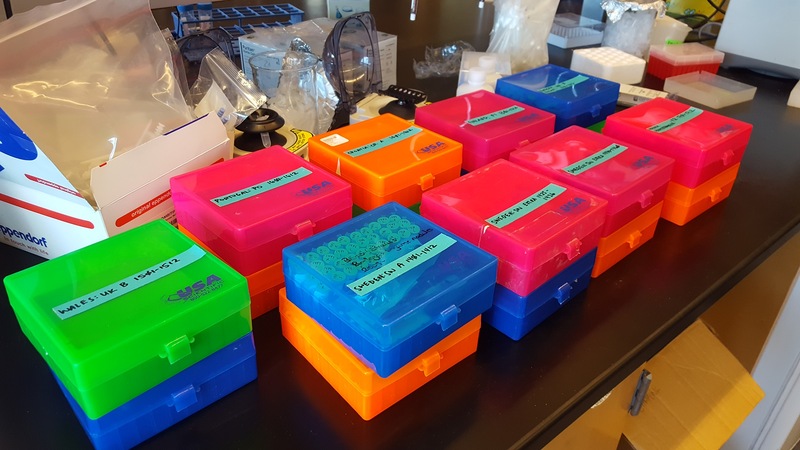 These kits are part of a larger collaborative project focused on re-sequencing of Zostera marina samples in conjunction with sequencing of additional marine and freshwater Alismatid species and their microbiomes. JGI recently sequenced and released the Zostera marina genome, and we are hoping to build on their efforts and explore population level variation within Zostera marina, as well as differences in genome content and structure between Zostera and other Alismatids, in conjunction with microbiome sequencing. 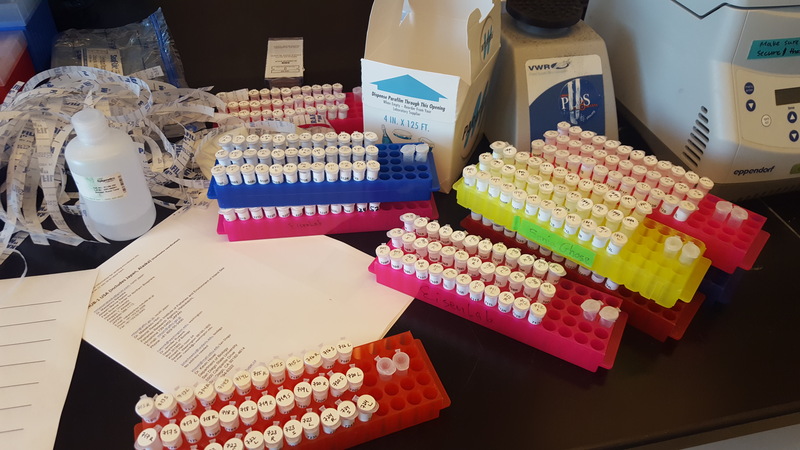 The sampling kits sent by the seagrass microbiome group have focused on the microbial aspect of this project. 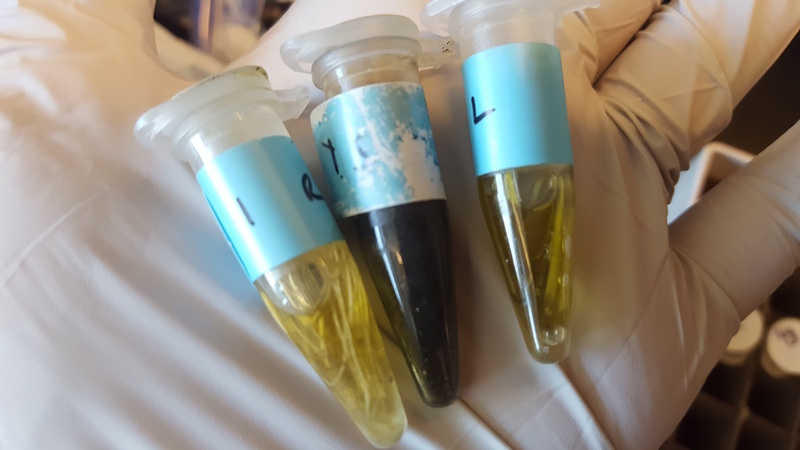 We have asked members of the Zostera Experimental Network (ZEN) as well as additional collaborators to sample both plant tissue for sequencing (coordinated through Jay Stachowicz and Jeanine Olsen) and microbiome samples. We are extremely excited about this sample set, as it covers populations of Zostera marina across many different environments, for which we already have extensive metadata through the ZEN group! We are requesting root, sediment (within the rhizosphere), and leaf tissue, as detailed in the diagram below (courtesy of Jeanine Olsen). Collaborators are also sampling at two depths per site (deep and shallow), so that we can examine microbiome differences that may correlate with population depth. We are sampling 24 individuals per site, 12 per depth. The kits are relatively straightforward and simple to both make and use, even if you’re not an experienced field microbiologist. 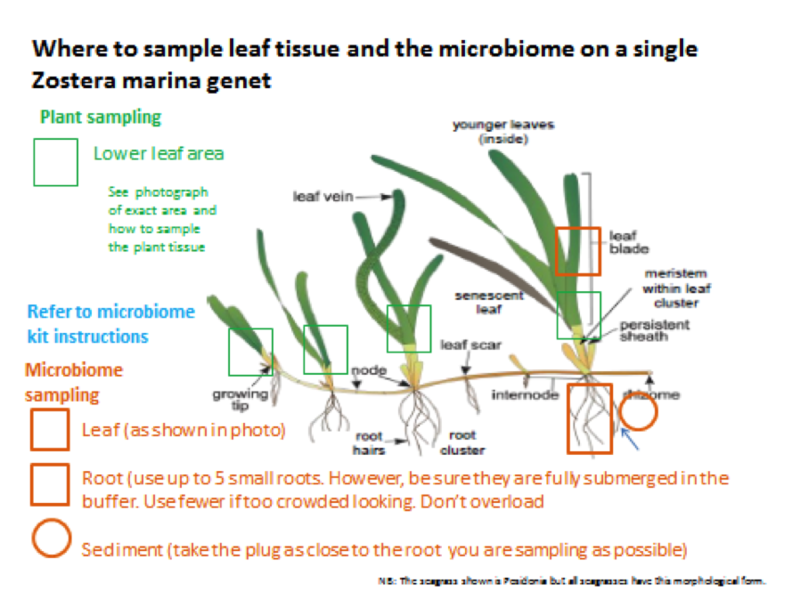 We followed the kit and samplingl details we previously used (https://seagrassmicrobiome.org/protocols/microbial-sampling-kit/), with a few updates. Tubes all ready to go! Completed kits, ready to go! We have sent out all of the kits, and have already started receiving some completed samples in the mail. Here is a close up of some of the samples from Kotzebue, AK. Samples for one individual from Kotzebue, AK. From left to right: root, sediment, and leaf. A huge thanks to our collaborators for sampling, and to everyone from the Eisen lab who has helped make and send kits. Stay tuned for updates on sample processing and data !